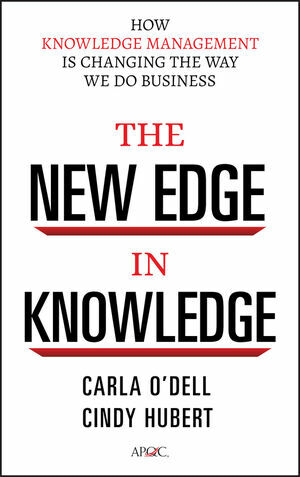 The New Edge in Knowledge captures the most practical and innovative practices to ensure organizations have the knowledge they need in the future and, more importantly, the ability to connect the dots and use knowledge to succeed today. Straightforward and easy-to-follow, this is the resource you'll turn to again and again to get-and stay-in the know. Plus, the book is filled with real-world examples – the case studies and snapshots of how best practice companies are achieving success with knowledge management. "Over the last decade, knowledge management has emerged as a key success factor for the modern corporation, driven by tremendous advances in business analytics. This book studies the best practices in knowledge management and how leadership companies are applying them today." "What has made our KM program strong is sticking to the fundamentals-- that's exactly what this book outlines. It provides trusted advisor guidance on how any company or organization can take the concrete steps to create and implement a world class KM strategy." —A. Gary Shilling, President, A. Gary Shilling & Co., Inc.
DR. CARLA O'DELL, one of the world's leading experts in KM, is president of APQC. She is the coauthor of numerous books and writes frequently for leading journals and magazines, as well as APQC's KM portal (www.apqc.org/km), and is a sought-after keynote speaker. CINDY HUBERT is the executive director of APQC's delivery services. Over the past fifteen years, Hubert and her team have worked with more than 450 organizations using APQC's proven KM methodologies. She writes frequently for leading journals and magazines and is consistently among the highest-rated speakers at internal and external conferences.